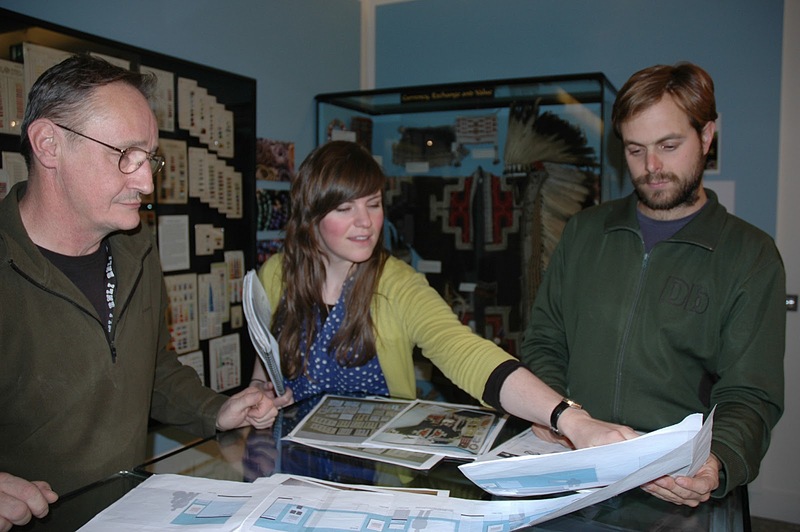 Phoebe Westson, volunteer at Haslemere Museum, looks at the plans for the ‘Made for Trade’ exhibition with Pitt Rivers Museum design technicians, Chris Wilkinson Alan Cooke. Sixteen curators, future curators, museum volunteers and museum-related students attended the ‘Meet the Reviewer’ event at the Pitt Rivers Museum on 7th November initiated by the Museum Ethnographers Group. The event was billed as an opportunity to critically interrogate the process of curating a temporary exhibition with curators, designers and conservators - in this case the ‘Made for Trade’ exhibition. Through presentations and gallery exploration in the morning, the rationale behind the exhibition was shared as well as practical and creative components. 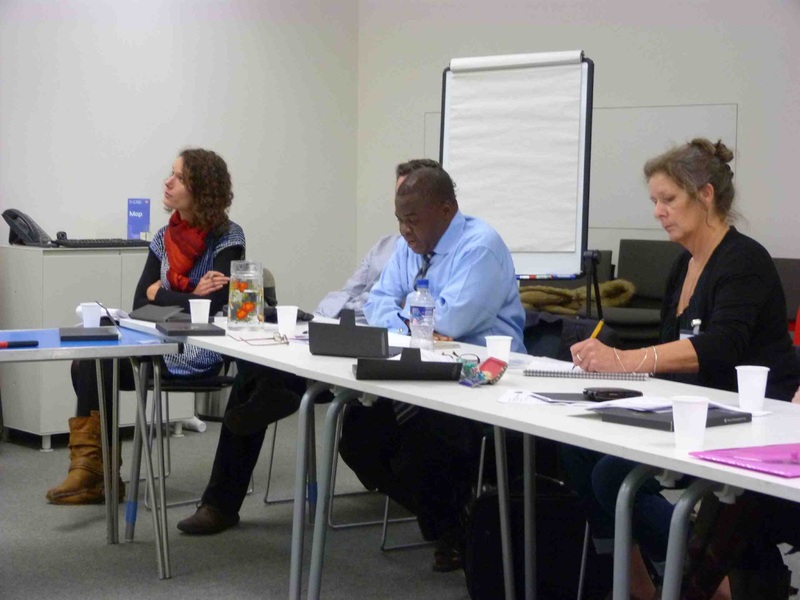 In the afternoon, the review of the exhibition by Sue Giles of Bristol Museum and Art Gallery was explored as a round table discussion in an informal ‘question and answer’ format. The review itself had been available as a web blog several weeks prior to the meeting and prompted a lively exchange led by Sue. Feedback from the meeting suggested that it had been very useful, particularly for continuous professional development. Subsequent to the session there have been links and support networks established between participants to discuss requirements for other museums, particularly those with ethnographic collections but no specialist staff in this area. A follow-up visit by Phoebe Weston, a volunteer at Haslemere Museum who is working on the redisplay of an ethnographic showcase, enabled display technicians and curators at the Pitt Rivers Museum to share and demonstrate simple and effective techniques for developing artefact display supports and interpretation. 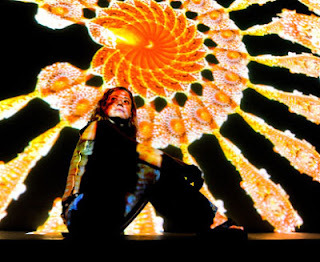 Sound Galleries is a beautiful short professional film of the 'sound galleries' event on November 23rd 2012. 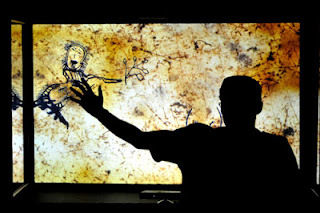 Curated by Dr Noel Lobley and Embedded composer in residence, Nathaniel Mann, a four hour playlist of Bayaka music was programmed, broadcast and streamed live from within darkened galleries as thousands of visitors explored by torchlight. The webcast was watched live in the Central African Republic by a group of Bayaka people who walked for more than an hour to get to a satellite phone in the WWF office in Bayanga. Reel to Real is a project running at the Pitt Rivers Museum, University of Oxford, designed to digitise and deliver the museum's unique ethnographic sound recordings. Please visit the project website for project updates and emerging content. On 26th and 27th November 2012, a number of people interested in the material heritage of British missions in Africa and the Pacific, gathered in Edinburgh for a two-day workshop. Funded by the Arts and Humanities Research Council and organized by Chris Wingfield, Karen Jacobs and Chantal Knowles, the workshop was called provocatively called ‘Who Cares?’ –a title that captures the ambivalent relationship many now have with Britain’s history of missionary endeavours overseas during the colonial period. The workshop, hosted by the Department of World Cultures at National Museums Scotland, was attended by a broad range of participants, most of whom work in a museum or university setting. We began by introducing ourselves and our work, which was time well spent as it served to highlight the connections in our lines of research as well as areas of mutual interest. In summarizing, Chantal Knowles noted that the word that came up most often during these presentations was ‘dispersal’: the material consequences of missionary travels can be found far and wide. For example, missionaries returning home to the UK after years away often tried to raise funds for their retirements by selling objects to museums so that many collections are now spread across a number of institutions. This dispersal has profound consequences for researchers working on missionary collections and is something that will no doubt be further discussed in the upcoming workshops in 2013. 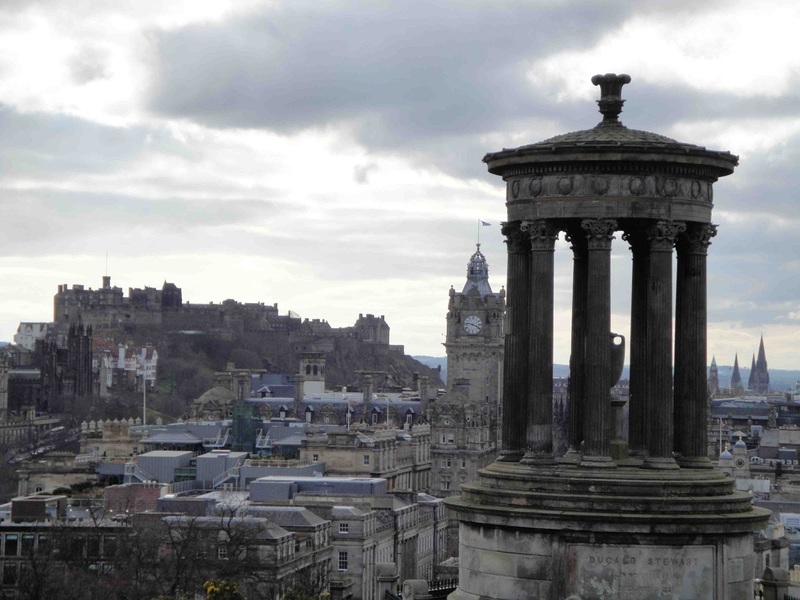 Our event in Edinburgh focused on the African context and was timed to coincide with the opening of a major exhibition at NMS to mark the bicentenary in 2013 of the birth of the most famous missionary of them all, David Livingstone. Curated by Sarah Worden, this excellent exhibition showcases Livingstone’s career and his legacy. His apocryphal encounter with Henry Morton Stanley, on the shores of Lake Tanganyika, is represented in the exhibition by the two hats worn by the men, displayed together in a single case. They brought to mind the material presence of the past as well as its passing, and served as a heady reminder of the ways in which the approaches and attitudes of yesterday remain today in our seemingly different world. That afternoon Friday Mufuzi, of the Livingstone Museum in Zambia presented a keynote address about the collections housed in his institution and the practical challenges it faces. I found it fascinating to hear of Livingstone’s continued heroic status in Zambia, a fact that makes returning him to history a difficult affair. After a long day, the group headed out for dinner at an African tapas restaurant. It was a truly unique dining experience! Tuesday morning began with a tour of the new permanent World Cultures galleries at NMS. Although there was only time for a snap-shot overview, one could clearly see the frequency with which missionary collections were implemented in the displays, although the missionary context was often not emphasized when these objects were presented to the public. This seems to be the fate of missionary collections around the country, while curators and the public are familiar and to some extent comfortable with the narrative of explorers and exploration in contemporary museum displays – how missionary collections are presented is a much bigger challenge. In the summing up discussions, one contributor noted the large number of Pacific specialists in attendance and wondered if more Africanists could perhaps be involved. To my mind this was to miss the point, what our gathering was able to achieve was to look beyond the locale of our own individual research; it presented an opportunity to use our own experiences to bring into focus the shared ideas that shaped the missionary endeavour. As part of Collections People Stories: Anthropology Re-Considered, an Arts Council England (ACE) funded project taking place at the Horniman Museum, 2012-2015, the Royal Anthropological Institute are seeking PhD Students or Postdoctoral Fellows, who plan to carry out fieldwork in 2013 to make small collections for the museum. Submission deadline: 11 March 2013. 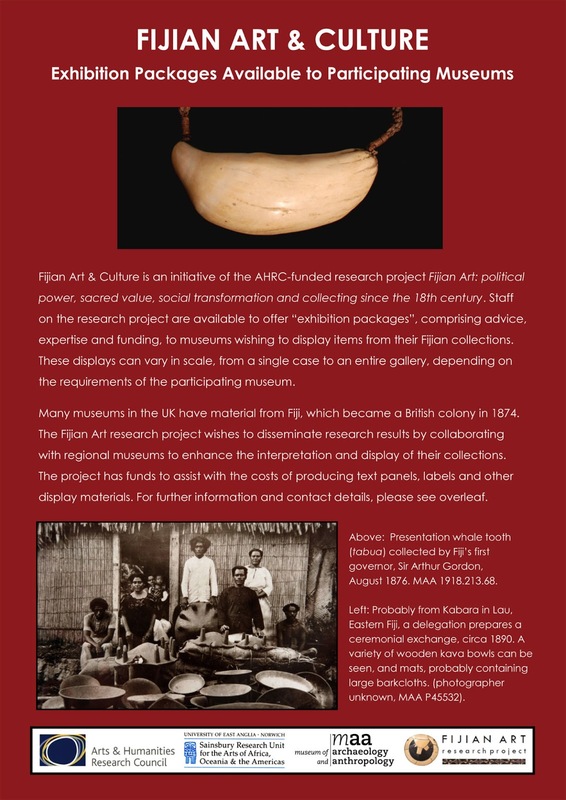 Collections People Stories: Anthropology Re-Considered is undertaking a detailed review and documentation of the Horniman’s Anthropology collections, highlighting the range, scale and importance of both its stored collections and those on display. The project sets out to investigate new and innovative ways of collections research, engagement and interpretation. 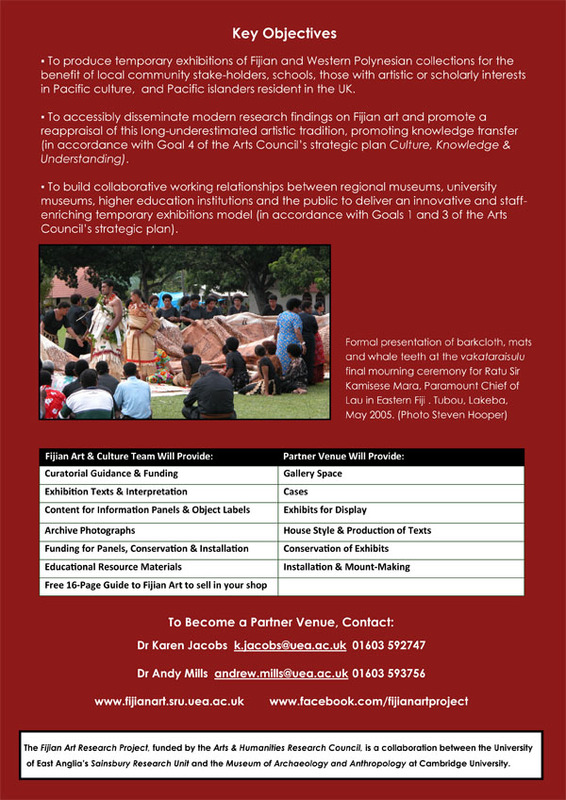 It will facilitate academic and community consultation and debate, to both unpack the legacy of the anthropology collections and unlock their values for communities and visitors today. The different activities and events over the course of the project will feed into establishing a vision, and funding bid, for a major new anthropology gallery at the museum. The Horniman has had a long legacy of fieldwork collecting. As part of the Collections People Stories project, they are keen to further expand on their remit of contemporary collecting at the museum. We would like applicants to collect a single object or small selection of objects related to their own research area that would be of interest to the museum. The object needs to be visually appealing and culturally significant, an object that would easily lend itself to being displayed at the museum. The object/s collected should also have a rich context and we strongly encourage the use of photographs and videos showing the object being used and/or being made. We are also interested in proposals that employ different models of field collecting, for instance asking local people what they would collect to represent themselves etc. Please send us a proposal (up to 1,500 words) outlining, in brief, your research interests, fieldwork plans, including a proposal of objects you would like to collect for the museum. £500 in expenses will be given to 5 people, selected by the Royal Anthropological Institute. Those selected will be expected to write a short object narrative, which will be posted on the Horniman Museum's website, http://www.horniman.ac.uk/. All submissions should be sent by 11 March 2013 to: Amanda Vinson, Royal Anthropological Institute, 50 Fitzroy Street, London W1T 5BT (email admin@therai.org.uk). These seminars are held on Tuesdays at 5.15pm in the Torrington Room 104, South Block, Senate House, University of London. For further details, or to have your name added to our e-mail list, please contact Felix Driver, Royal Holloway (f.driver@rhul.ac.uk) or Miles Ogborn, Queen Mary (m.j.ogborn@qmul.ac.uk). We are grateful to Royal Holloway, Queen Mary, Kings, Birkbeck, UCL, LSE, University of Sussex, Open University and the IHR for supporting this seminar series.